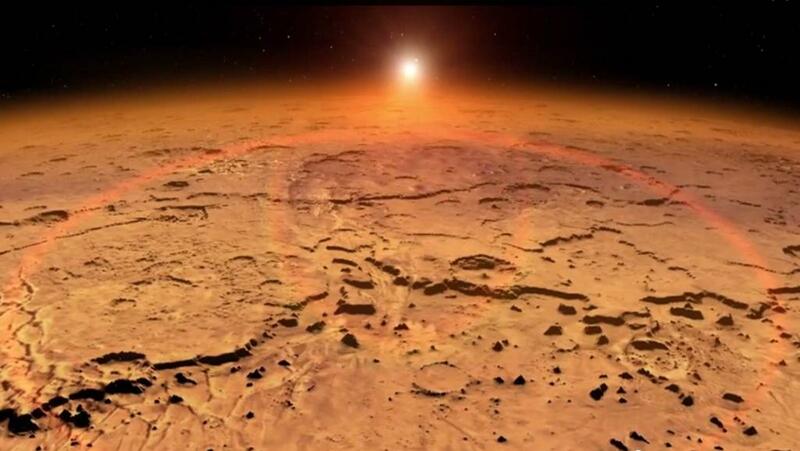 September 8, 2014 – On September 21, 2014, the Mars Atmosphere and Volatile Evolution spacecraft will complete roughly 10 months of travel and enter orbit around the Red Planet. The orbit-insertion maneuver will be carried out as the spacecraft approaches Mars, wrapping up an interplanetary journey of 442 million miles (711 million kilometers). Six thruster engines will fire briefly for a “settling” burn that damps out deviations in pointing. Then the six main engines will ignite two by two in quick succession and will burn for 33 minutes to slow the craft, allowing it to be captured in an elliptical orbit. This milestone will mark the culmination of 11 years of concept and development for MAVEN, setting the stage for the mission’s science phase, which will investigate Mars as no other mission has. “We’re the first mission devoted to observing the upper atmosphere of Mars and how it interacts with the sun and the solar wind,” said Bruce Jakosky, principal investigator for MAVEN at the University of Colorado in Boulder. These observations will help scientists determine how much gas from Mars’ atmosphere has been lost to space throughout the planet’s history and which processes have driven that loss. Calibration of the mission’s three suites of science instruments – the Particles and Fields Package, the Remote Sensing Package and the Neutral Gas and Ion Mass Spectrometer – was completed during the cruise phase to Mars. Meanwhile, teams in California, Colorado and Maryland carried out rehearsals of the entire orbit insertion twice. The science team also performed a weeklong simulation of the planning and implementation required to obtain science data. Two months prior to arrival at Mars, all instruments were turned off, in preparation for orbit insertion. During orbit insertion, MAVEN will be controlled by its on-board computers. By that time, the team will have uploaded the most up-to-date information about the spacecraft’s location, velocity and orientation. The insertion instructions will have been updated, and the fuel valves will be open, to warm the fuel to an operating temperature of about 77 to 79 degrees Fahrenheit (25 to 26 degrees Celsius). Otherwise, during the last 24 hours, the spacecraft will carry out preprogrammed procedures to make all systems as “quiet” as possible, which is the safest condition for orbit insertion. These steps include automatically executing a new version of the fault protection, which will tell the craft how to react to an on-board component anomaly leading up to or during orbit insertion. In addition, the spacecraft will have to reorient itself so that the thrusters are pointed in the correct direction for the burn. In this final orientation, MAVEN’s high-gain antenna, which is used for most communication with the spacecraft, will point away from Earth. During that period, MAVEN’s low-gain antenna will be used for limited communication capacity at a reduced data rate. “Then, there will be a sigh of relief,” said Carlos Gomez-Rosa, MAVEN mission and science operations manager at Goddard. This science orbit will be elliptical, with the spacecraft flying about 90 miles (approximately 150 kilometers) above the surface at periapsis, or closest point, in the orbit to “sniff” the upper atmosphere. At apoapsis, the farthest point from the surface, MAVEN will pull back 3,900 miles (roughly 6,300 kilometers) to observe the entire atmosphere. MAVEN’s principal investigator is based at CU/LASP. The university provided science instruments and leads science operations, as well as education and public outreach, for the mission. Goddard manages the project and provided two of the science instruments for the mission. Lockheed Martin built the spacecraft and is responsible for mission operations. The University of California at Berkeley’s Space Sciences Laboratory provided science instruments for the mission. NASA’s Jet Propulsion Laboratory in Pasadena, Calif., provides navigation support, Deep Space Network support, and Electra telecommunications relay hardware and operations.